oh my god Daniel!! This one is awesome!!! I saw something like this at a comic convection in Ottawa! Its a really neat ring! adorably creepy! I love it!!! How many creations have you made. This is really cool. this is awsome i wish i could buy everything in your shop! I wonder if you could be so kind as to tell me where you got the materials to make this little fella? He's so adorable, and I've been wanting to make a steampunk ring for so LONG. 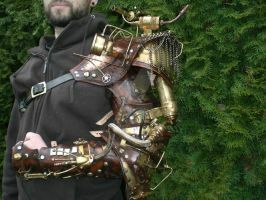 Future Nano Robot Technology Mixed with Classic Steampunk Design better make this real. Cus this is too cool. That is sooooooooooooooooooooooooo amazing!!! 0.0 I love it! how did you make it?!!?? This ring is still available? I love it!!!! It's so cute! I like it a lot. Ha, that looks cute. Like something out of Incredibles. That's supremely clever and deserved the DD. Cutes´t robot i have ever seen. This is awesome, the use of the findings on the front as claws is really creative! So brilliant. You have quite an imagination. Amazing details. I think it looks great! And I hereby dub him....Pinchy!